Two of the biggest names of world cricket – Brian Lara and Brett Lee once again came face to face to give their fans pure joy as the two gentlemen collided but on a different field. The two stalwarts, who are a part of the expert broadcast panel in the cash-rich Indian Premier League (IPL) 2019, took time out from the hectic schedule to indulge for a gully cricket clash on the streets of Mumbai. In the two overs face-off, former Aussie speed demon enthralled the capacity audience present on the streets as he bowled a sharp bouncer at Windies great Brian Lara, who swayed out of the way of the delivery. Lee posted the video on his official Instagram account and hailed the former Windies champion. 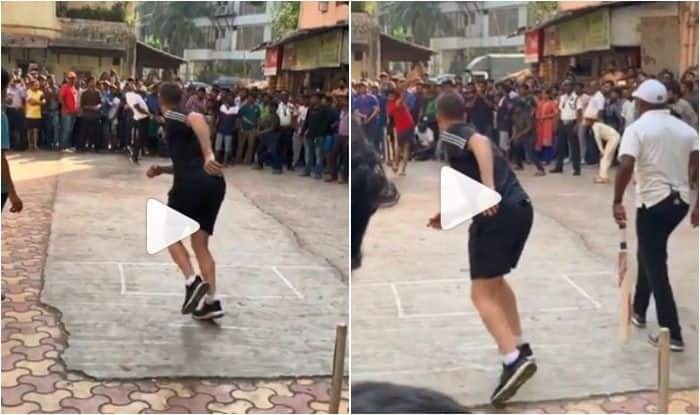 Lee captioned the video, “A impromptu game of Gully Cricket in Mumbai with my good mate @bcl375400. Lee vs Lara, 2 over clash. Had to bowl my two favourite deliveries. Bouncer to Lara followed up by the Yorker to some poor bloke on the other team. Good crowd to cheer on the great West Indian! Brian Lara. #hehasstillgotit”. In the second video posted by Lee, he can be seen bowling an inch-perfect yorker to another localite which went on to rattle the stumps. Earlier, former England and South African skippers Kevin Pietersen and Graeme Smith were also involved in a gully cricket clash which drew a lot of local fans support and cheer. In IPL 2019, Kolkata Knight Riders (KKR) host Delhi Capitals (DC) in match 26 of IPL at the Eden Gardens on Friday. On a doubleheader, Saturday, Mumbai Indians (MI) will host Rajasthan Royals (RR) which will be followed by Royal Challengers Bangalore (RCB) travelling to Mohali to face Kings XI Punjab (KXIP) in a must-win clash.